If you’re looking for something smart but not too heavy, you might want to give Loren Estleman’s latest Valentino mystery a shot. Alone is a modern-day work with a shout out to the glamorous age of big-screen legend Greta Garbo. As Valentino works to renovate a run-down movie house, he becomes entangled in a clumsy murder which ultimately invokes the voice of his beloved Garbo. Alone is good clean fun and packs sharp, blue-streak dialogue in its pages. Estleman relies on brains for brawn rather than devices of profanity and perversion to work his story. Crediting his readers’ intelligence and ability to follow his quick lead, Estleman moves with a flip yet debonair style that conveys sincere (albeit sarcastic) sentiment. Alone’s characters provide a humorous commentary on age, politics, love, and greed. Though Estleman’s latest won’t rock your literary world, it will provide you with nice slice of escapism. Loren D. Estleman is the author of more than sixty novels. He has earned four Shamus Awards, five Spur Awards, and three Western Heritage Awards. He lives in central Michigan with his wife, author Deborah Morgan. * For more on this man behind many books, you can link to Mr. Estleman’s “About” page here. *Taken from book jacket courtesy of Forge Books. -Support your local bookstores, libraries, and universities. It matters! This quote from Abraham Verghese is not all that surprising given the eloquence and depth of Cutting for Stone, his beautiful first novel which was published last year. A professor at the Stanford University School of Medicine and holding an M.F.A. from the Iowa Writers’ Workshop, Verghese has placed himself in perfect position to translate reality into fiction. Following his two non-fiction works (My Own Country and The Tennis Partner), Cutting for Stone follows the life of twins Marion Stone and his brother Shiva as their lives wind down different paths amidst the political and domestic unrest in Addis Ababa. An epic journey of the soul, Verghese’s characters attest to the innate longing and necessity of our ties to family and homeland. Borders in Ann Arbor will host Cutting for Stone author Abraham Verghese for a reading and signing event on Tuesday, Janurary 26, 2010 at 7:00 PM. As always, it’s a good idea to call and confirm prior to this event for any additional information. -Support your local bookstores and universities. It matters! 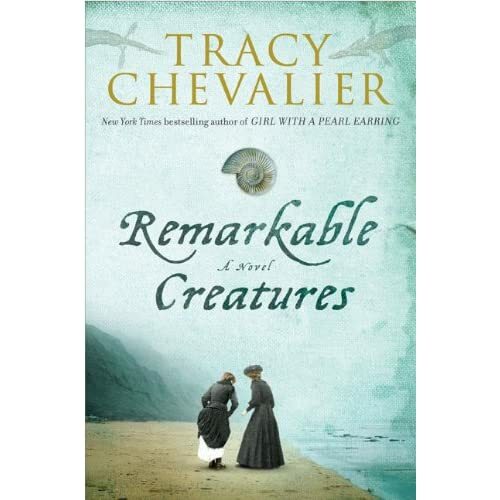 Tracy Chevalier, best known for Girl With a Pearl Earring, recently released her sixth novel titled Remarkable Creatures. Though the true-life story of the 19th century fossil hunter Mary Anning is fascinating, I’m afraid this fictional version falls short. The life story of Mary Anning is a worthy one, but while Chevalier’s characters stand, they don’t inject quite enough ire and passion needed to fuel the feminine fury of this novel. The metaphors are forced and I found them pulling away from the stronger themes of women’s liberation and its role in academic history. That said, Remarkable Creatures does provide a quick, easy slice of escapism. Without demanding too much from the reader, Tracy Chevalier’s latest will at the very least walk you through the early museums of London and introduce you to the key scientific players of 1800’s academia. Additionally, through the eyes of her characters Chevalier is able to personify the perceptions and practices of early England resulting in an unexpectedly pleasant lesson in history. Overall, the content of the novel is interesting while the story itself is tepid. And while I can’t recommend the book as a powerful read, it is definitely worth a trip to Tracy Chevalier’s site for more on the facts and fossils behind the story. Unfortunately, Remarkable Creatures is rather unremarkable. There are a couple of books that I’ve recently finished which are listed below with my brief review attached. They are all newer titles that currently sit on or very near the latest best seller lists. Friends will often ask me if I have read a particular title, or for the suggestion of a solid personal or book club read. Because it takes a lot of time and thought to do a detailed review of each book, I am posting these “quickies” for your reference and perusal. As I’ve mentioned before, I rarely buy books. A hardcover purchase takes much plotting and thought before I’ll take the plunge. With one of my criterion being “passability”, imagine my pleasure in the pay off of Homer & Langley. I don’t know who to give it to first. How can a book about pathological hoarding hold such beauty within its pages? Doctorow’s prose is breathtaking as he evokes the pathos of brothers Homer and Langley Collyer. Lending dialogue as voice to the reclusive brothers, Doctorow allows you to take up literary residence in Collyer’s Fifth Avenue mansion to witness the bizarre decline of a once prominent family. This freakish, true story of the brothers is told with a compassion and grace that allows the reader to perhaps comprehend the incomprehensible. *A beautiful book. I feel this is one of those books that raises the bar for a reader. The vocabulary and language is wonderful and will probably throw a few “unknowns” onto your list (I hit the dictionary a number of times). As a book club choice, you will have plenty to discuss even after you get past the clutter. Instead of getting too caught up in the physical story, focus on the sensuous writing instead. *Enjoy my full review on Bookbrowse. Following her bestseller The Glass Castle, Jeannette Walls brings us more eccentric family lore. Calling it a “true-life novel”, Walls admits that even with her considerable research and cross-referencing, the dialogue left her uncomfortable claiming it as a memoir. Taking small liberties with the voice of grandmother Lily Casey Smith, Walls spins the true-life tale of her grandmother, and her incredible ranching days of the Old West. Though I had my doubts that Walls could pull off a second bestseller, I suspect she might have another one on her hands with Half Broke Horses. I absolutely loved this book for its laugh-out-loud common sense and personality. *This book is really fun. From a literary standpoint it won’t change your life, however, the western voice is tough and engaging. This is an entertaining read for yourself or as a book club, and reading The Glass Castle isn’t necessary for its enjoyment or understanding. There are a few books that I’ve recently finished which are listed below with my brief review attached. They are all newer titles that currently sit on or very near the latest best seller lists. Friends will often ask me if I have read a particular title, or for the suggestion of a solid personal or book club read. Because it takes a lot of time and thought to do a detailed review of each book, I am posting these “quickies” for your reference and perusal. I’m not surprised Brooklyn made the Man Booker Prize longlist this year. This tight novel about a young woman who makes her way from small-town Ireland to big-city Brooklyn caught me completely off guard. I’d heard the title being tossed around quite a bit, but I’m glad I went into the story blind. The hitch is Toibin’s simple prose which runs counter to the emotional juice fired sentence by sentence. Small movements, choice descriptions, and spare yet perfect dialogue enhance the sensitivities of each character, ultimately entangling the reader as active participant. I’m not quite sure when it happens, but you’ll see that Brooklyn: A Novel subtly morphs into Brooklyn: A Mystery which keeps you guessing right up to the last page. *This is a an interesting literary work on all fronts. There is much to discuss in both content and form. As a book club read, everyone will have an opinion; the book begs it. If it feels slow, look for the undercurrents. As a personal read, it depends on your tastes. This is not fast-paced action as you know it, but trust that you will get involved. I haven’t read James Patterson since Along Came A Spider which was so long ago I don’t even remember it. However, when I noticed this book rocketed to #1 and held its standing, I decided to see what the fuss was about. This is a bit tricky because while the book is made-for-movie material, its subject matter is utterly disturbing. Dealing with the KKK, white supremacy mentalities, and lynchings of the Old South, I felt nauseated reading this novel but pushed on needing to see how it would resolve. I suppose one might call it entertaining if it wasn’t so distressing, and hopefully this discomfort is the impetus behind Patterson and DiLallo’s latest work. Assuming the wrenching events in the book are research-based, this novel could be used as a teachable moment rather than mere fiction based on the historical plight of Southern Blacks. *I would recommend this book as a personal or book club read only to enhance sensitivity/awareness toward our volatile racial history in America. There are two books that I recently finished which are listed below with my brief review attached. They are newer titles that currently sit on or very near the latest best seller lists. Friends will often ask me if I have read a particular title, or for the suggestion of a solid personal or book club read. Because it takes a lot of time and thought to do a detailed review of each book, I am posting these “quickies” for your reference and perusal. I did not read The Shadow of the Wind, Zafon’s first novel which was a biggie with the book clubs. However, if it is anything like The Angel’s Game, I think I’ll pass. This bizarre mystery reminds me more of a Harry Potter meets Dante’s Inferno, and seemed to me a poor attempt at chills and thrills. who cares for all the crinkling of the pie? This book is so different, so engaging, and so much fun that I can’t stop suggesting it to people. After a stretch of hum-drum fiction, I was pleasantly caught off guard by this Debut Dagger Award winner. I’m typically not a mystery reader, but this is not your average mystery as it holds one of the most plucky, winsome main characters I have ever met. Flavia de Luci is only eleven but trust me when I tell you, she’ll keep you busy for 373 straight pages. An aspiring chemist, Flavia’s intellectual capabilities might be a bit of a stretch, but author Alan Bradley had me clearly convinced that this girl can do it all. As Flavia dukes it out with her two sisters, Bradley’s hot, literary knowledge tucks itself neatly into the family discord adding serious prose to the dialogue. The biggest treat… life through the eyes of an eleven-year-old. *This witty, sharp, and charming novel is a must. A quick read, I would suggest it as a great personal choice and an entertainer for any book club.